The degrees and programs offered by the 10 campuses of the University of Hawaiʻi System range from certificate and vocational to baccalaureate, graduate and professional. Download Adobe Reader to view .pdf files. 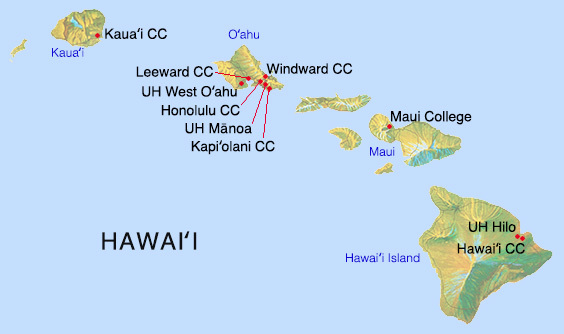 UH Mānoa, UH Hilo, UH West Oʻahu, Hawaiʻi CC, Honolulu CC, Kapiʻolani CC, Kauaʻi CC, Leeward CC, Maui College and Windward CC are our major campuses located across the Hawaiian Islands. Choose from the list to view more details.